Following the 2014 collaboration ‘Tunguska Event’ with Envenomist (reviewed here), (Erik) Jarl returns with the longest work of his career. Being comparable to the thematic angle covered on ‘Tunguska Event’, ‘Case 1959 – Dyatlov’ takes a similar approach of utilized an unexplained event to thematically frame the music. Here ‘Case 1959 – Dyatlov’ refers to the Dyatlov Pass incident of February 2, 1959 which resulted in the deaths of nine experienced hikers in the northern Ural Mountains, Russia. Through post-event investigations Soviet Investigators at the time determined the hikers had torn their tents from the inside in order to escape from an apparent threat and although the bodies showed no signs of struggle or external injuries, two victims had fractured skulls and broken ribs. Without clear explanation Soviet authorities formally concluded that an ‘unknown compelling force’ had caused the deaths, where the mysterious circumstances were further compounded by access to the region being prohibited for three years after the incident. Although details of events remains uncertain several theories exist, including: possible avalanche; a military accident; a naturally occurring phenomenon called ‘infrasound’* resulting in the party abandoning their camp; or the more bizarre such as a hostile encounter with extraterrestrial life. As was much the case with ‘Tunguska Event’ CD, here the album sonically engenders a tensile atmosphere and broadly mysterious tonal aesthetic. Musically only 3 tracks are presented, with two tracks included on the first CD (43 minutes), and the single 61 minute track included on the second CD, but with such lengthy compositions it should be clearly indicative of an elongated dark ambient framework. On the first disc the 19+ minutes ‘Part 1 – Introduction’ quickly pulls the listener in with a sparely layered, sweepingly widescreen soundscape, augmented with clinically tinged pulses and throbbing bass textures, where each element rise and fall in prominence as the track progresses. Further ‘radio wave’ type layers increase tonal complexity and variation; whilst others have a more sub-orchestral sonic frame; meaning the soundscapes build to quite weighty swirling sonic realms, despite its minimalist feel. ‘Part 2 – Barrier’ spans 23+ minutes and is slightly more ‘aquatic’ by featuring a ‘wet’ toned amorphously enveloping dark ambience. Again it is meticulously multi-layered in its sonic construction to create tonal variety and complexity, where a range of distant wailing tones and sporadic pulses are used in a very clever way to evoke a sense of rising dread. Some sparse metallic edge rhythmic elements provide yet more tonal variation within the swirling sonic mass, whilst low frequency bass pulses perhaps are representative of the ‘infrasound’ phenomenon (noting again that all elements follow a tensile upward trajectory over the track’s lengthy span). The third and final ‘Part 3 – Aftermath’ is found on the second disc and spans a much greater length than the first two parts combined and although opts for much similar sprawling dark ambient sound, the mood here is one of clinical contemplation and methodical investigation. In effect for the bulk of proceedings the piece has less movement, with more subtly in the shifting tonal soundscape (i.e. shimming crystalline drones, sparse metallic tinged sounds and underlying pulsing textures etc.). 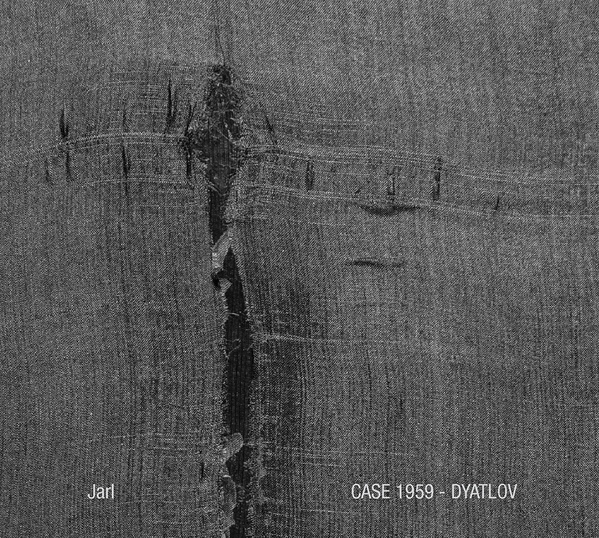 Having heard a number of Jarl’s albums over the years, it could be said that there is certainly a tonal consistency with Jarl’s work, but to his credit he is able to create minimalist soundscapes of slow morphing sonics which retain listen-ability and interest over extended lengths. The cover images also makes a minimalistic aesthetic statement, obviously taking inspiration from the album’s theme, where the cover images shows cut/ torn/ distressed fabric. All in all another fine work from Erik under the Jarl banner. * – ‘infrasound’ can be defined as wind colliding with topographic features can produce low-frequency waves ranging from audible to sub-audible, which based on laboratory tests have induced powerful feelings of nausea, panic, dread, chills, nervousness, raised heartbeat rate and breathing difficulties in subjects. These effects, or that such sounds were mistaken for an impending avalanche, are theorised as the reason for the hasty camp abandonment in the Dyatlov Pass incident. This entry was posted in dark ambient, drone, Reverse Alignment, Uncategorized by noisereceptor. Bookmark the permalink.